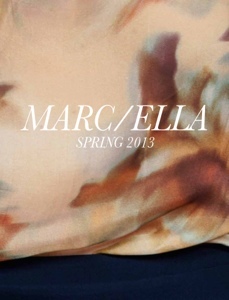 Welcome to the world of Marc-Ella! Emerging brand created by two childhood best friends; Jaime Torres & Brenda-Liz Fadul who love the idea of creating ultra wearable clothing for today’s 20-something’s, launched their first collection of women’s wear for spring 2013. Edgy, free, feminine and sophisticated with a twist of androgyny are all the elements that fuse the brand together. This season’s collection was inspired by the fun and simple looks of the fifties while zoning in on menswear as women’s wear from the mid 80’s. Picture it as if Sandra Dee & Molly Ringwald had a baby! I love it!!!! I absolutely see a bright, nifty, & rad future for the duo design team who I just happen to love as dear friends!!! No bias here!! The collection is truly great!! Just see for yourself! I AM TRULY OBSESSED WITH THIS SLICKER!!!!!!! OBSESSED IS ACTUALLY AN UNDERSTATEMENT!! I think one should be made in every color!! Wowza Wowza Wowza!!! Love love love!!!! To learn more about Marc-Ella clock the link! Win Passes To Shecky’s Fashion Holiday Market With Ken Wroy!!!! !